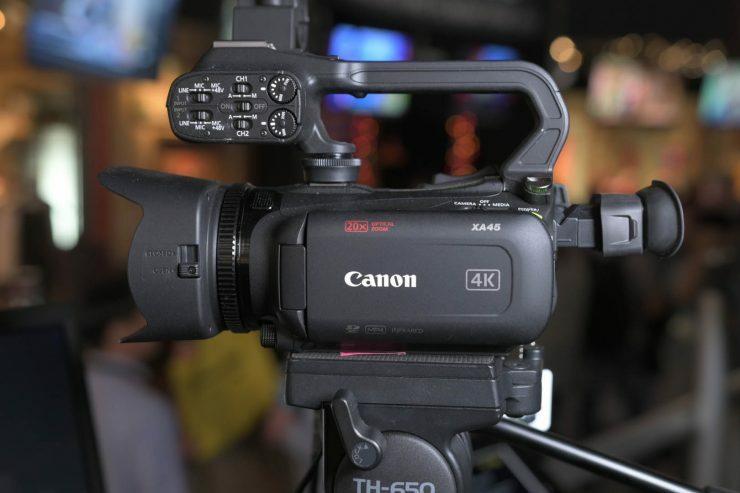 The Canon XA40, XA50, and XA55 are three new 4K UHD camcorders in Canon’s professional XA-series. The XA55 and XA50 are 4K UHD camcorders with a 1.0-type sensor, Dual Pixel CMOS AF and a 15x Optical zoom. The only difference between the XA50 and XA55 is that the XA55 has 3G SDI. All three cameras are suitable for 4K UHD and HD productions. Through the use of Over Sampling, the HD recordings benefit from using the whole sensor area. 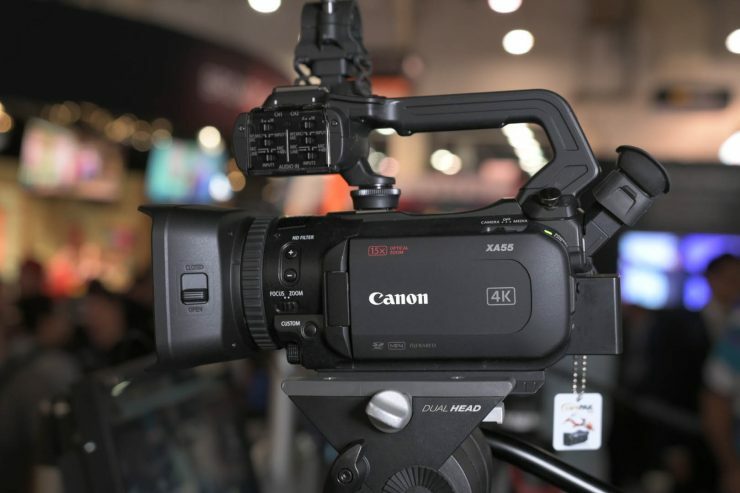 The new XA-series camcorders are being aimed at professional users for applications such as news gathering, corporate video and documentary production. The XA50 and XA55 are the first models in the XA-series to include a 1.0-type CMOS sensor with Dual Pixel Autofocus technology. 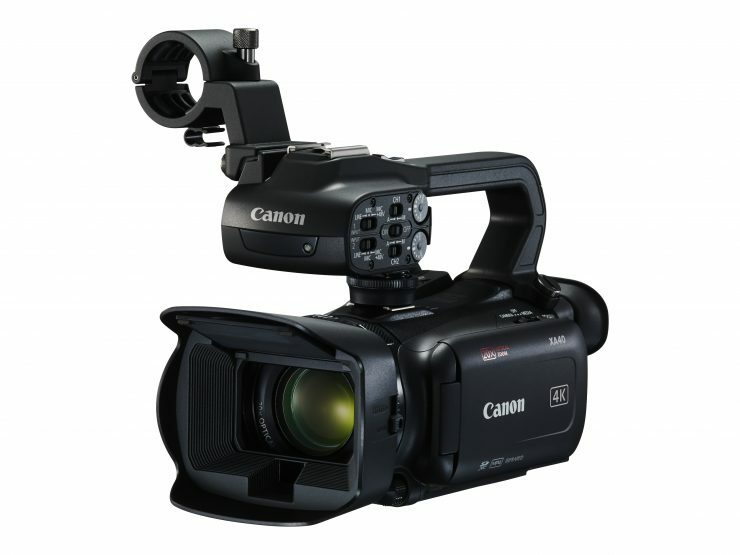 The camcorders also feature a Canon 4K 15x Optical zoom lens with Super UD elements (Ultra-Low Dispersion). They feature a 25.5mm to 382.5mm equivalent focal range. The cameras also use a single DIGIC DV6 image processor and Over Sampling HD processing, as well as 5-axis image stabilization. 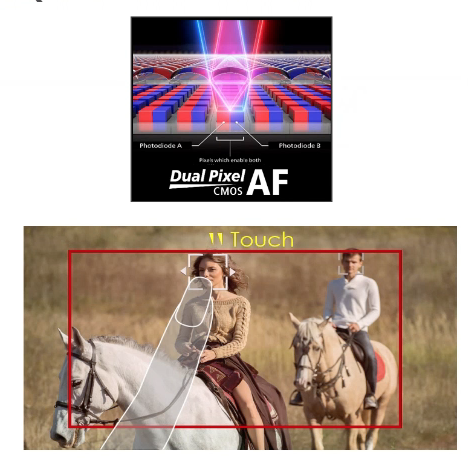 Around 80 percent (vertical and horizontal) of the image is covered by the Dual Pixel CMOS AF. Face detection AF, Face-priority AF, Face only AF and touch tracking operation are all possible. 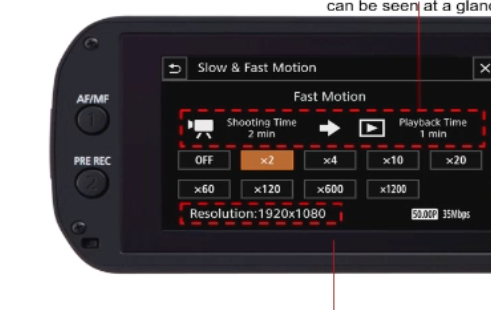 Canon has also included the same Dual Pixel Focus Guide found in the C200 and C300 Mark II that provides a graphical user interface to aid manual focusing. 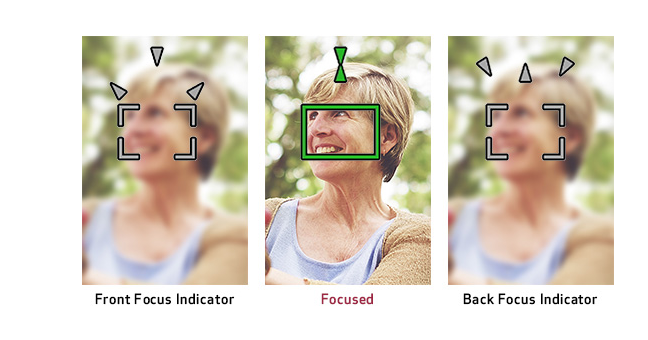 This innovative guide applies Dual Pixel CMOS AF phase-difference technology to assist in achieving the same highly accurate focus. The XA55 and XA50 can record in XF-AVC and MP4 recording at up to 4K UHD 25P to SD cards. Slow & Fast Motion recording with a maximum speed of 1200x in both 4K and Full HD is also possible. Dual SD card slots enable relay and back-up recording. The cameras have low power consumption with their battery supporting more than two hours of continuous operation. Professional-quality audio is possible with linear PCM 4-channel audio recording and two XLR terminals, while 3G-SDI terminals (XA55 only) provide a Full HD of 4:2:2 10-bit signal. The XA40 is a palm-sized camcorder that weighs in at 730g (body only). It weighs in at 1.2kg with the detachable XLR handle unit, battery, lens hood and microphone holder. 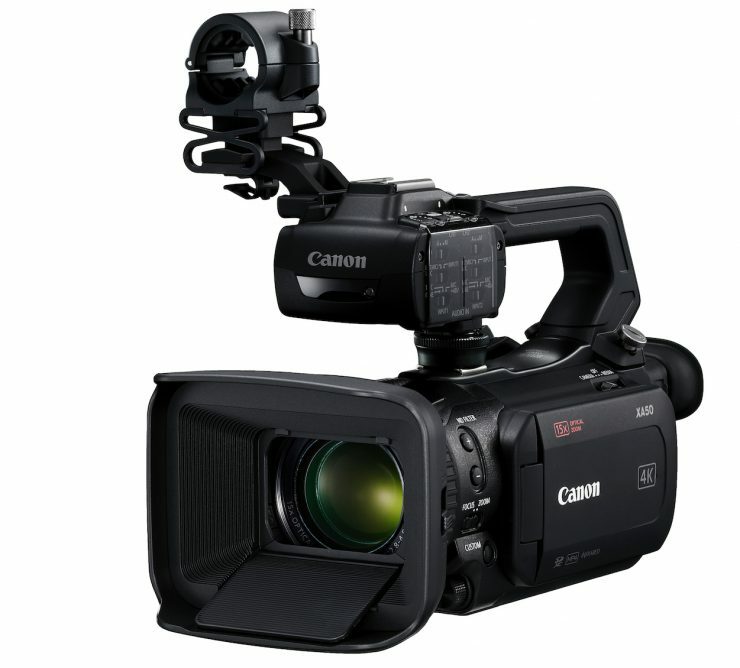 Canon claims that it is one of the most portable and compact 4K UHD professional camcorders currently available. The camera uses a combination of a 4K UHD 1/2.3-inch type CMOS sensor and DIGIC DV6 image processor to deliver 4K UHD images, and Full HD images using Over Sampling HD processing. 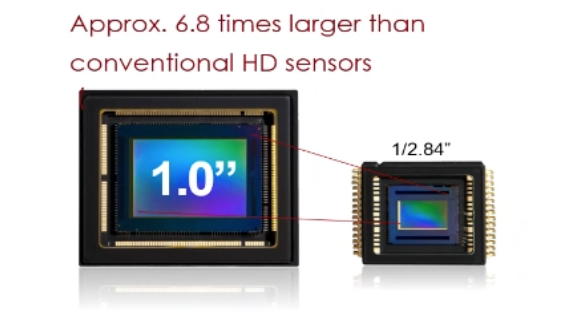 The camera only records in MP4 and it is capable of UHD 150Mbps at 25P and Full HD at 35Mbps in 50P and 17Mbps in 25P. Continuous Slow and Fast motion recording are available in both UHD and Full HD with a maximum speed of 1200x. The camera comes with a 20x Optical zoom with wide angle starting at 29.3mm. Just like the XA50 and XA55, the XA40 uses 5-axis image stabilization, with one exception. Canon is using what they call a 3D real-time lens group structure. I won’t bore you with the technical details of how this works, but basically, it allows for much better image stabilzation when the lens is being zoomed. Canon has also given the XA40 an Infrared Mode – making production possible in conditions with little to no ambient light . There is a 3.0-inch LCD touchscreen as well as dual SD card slots for backup and relay recording. The camera offers support for linear PCM 4-channel audio and features a built-in stereo mic and two XLR terminals included as standard. 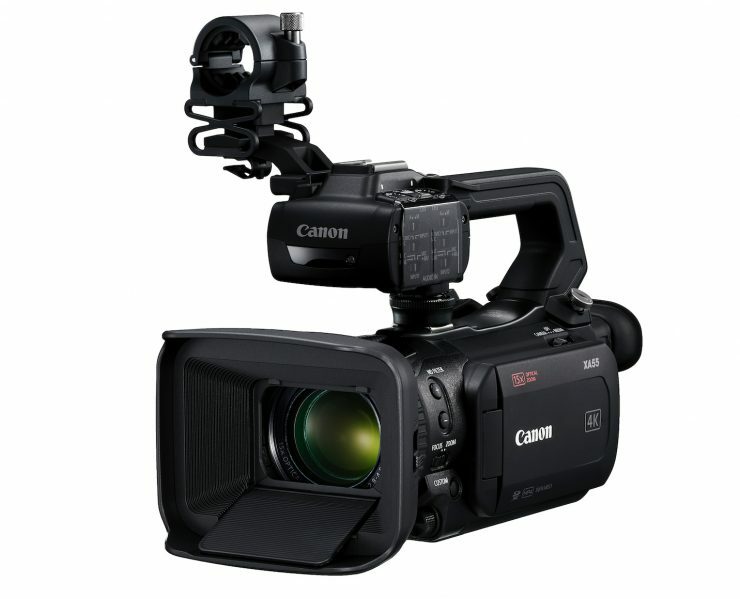 The XA45 is exactly the same as the XA40, the only difference is that it has 3G SDI. Where do these cameras fit in the Canon’s lineup? The XA40 slots between the XA11 and the XA15, while the XA50 fills the gap between the XA15 and XF400. 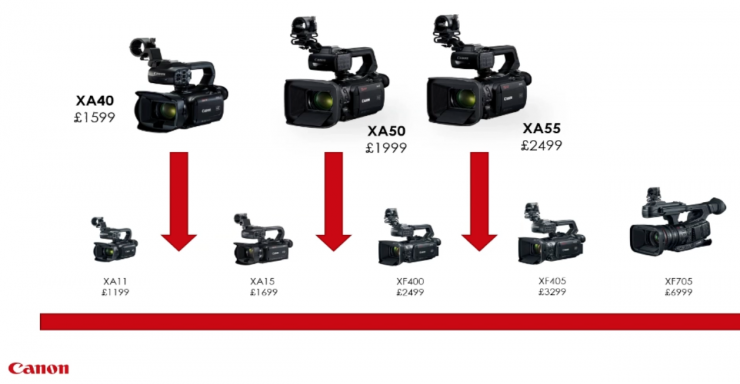 The XA55 sits between the XF400 and the XF405.